Tinkering Tank is a project which develops art activities for children and their families for Cairns Children’s Festival 2017; a mix of interactive displays and construction activities, designed to encourage creative collaboration between generations. Community Grant recipient, via the Regional Arts Fund, as managed by Flying Arts Alliance. It’s also an incubator for developing artists and product that engages children in the creative arts and the cultural life of their city. Tinkering Tank is a favourite feature of the Cairns Children’s Festival: an annual, multi-arts festival for children aged 2-12 and their families. Ages 2-7: Devise, trial and deliver creative activities, creating sculptural works with very large quantities of simple materials. Ages 7-12: Explore public art with a six week design program, leading to a display and making activity at the festival. Through the eight workshops leading up to the children’s festival and seven school visits, artists tinkered with different models of delivery, experimenting with different materials and observing the changes in children’s level of creativity, enjoyment and behaviour. One new product has emerged as a result of the ‘Little Tinkers’ program (ages 2-7); a giant web constructed from flagging tape. 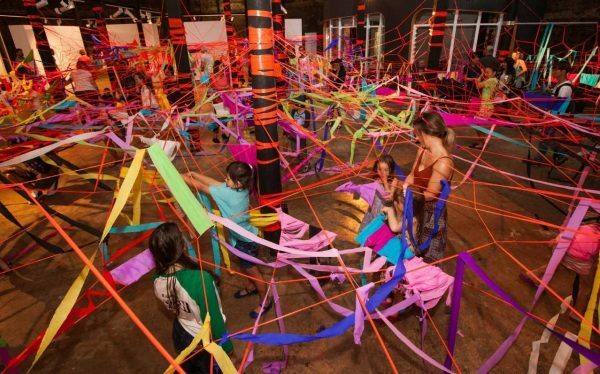 Through participation, children built up the environment until it engulfed the exhibition space, adorned it with crepe paper, inhabited it and, when materials were depleted, harvested them and recycled them as other playthings. Artist Rosie Miller has honed this activity and is repeating it in schools throughout Cairns. This activity is now proven and ready for export to other festivals.